We are the industry leader in the design and manufacture of DC brushless motors for commercial, business, helicopter and military applications. Our brushless motors have voltage ratings of 18 - 270 VDC and are ruggedized for extreme high temperature applications. We have developed specialized packaging to ensure proper EMI filtering while meeting power quality requirements and operating at currents of upwards to 150 A continuous. Our brushless motors can be customized to include electronic controllers. 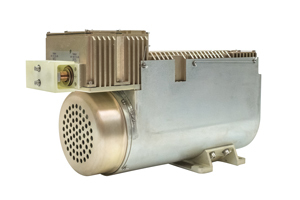 The integral electronic controller performs all functions necessary for proper commutation of the motor and includes features such as current limiting, stall protection, over temperature shut down and bus ripple monitoring. Each motor is designed to operate continuously at full rated load in high temperature environments. Common applications of our DC brushless motors are: fans / blowers, rotary actuators, fluid pumps, integrated electronics and much more!